Five days ago, my whole world came crashing down with a sickening thud. Erik Karlsson, the captain of the Ottawa Senators, was traded to the San Jose Sharks. I still remember where I was when I heard he was traded like it was yesterday, or like five days ago. I was in line at Hortons to get my daily dozen Boston Creams. Everyone was waiting patiently, waiting to get their hands on a deliciously sweet, yet savoury, pastry. Then we all heard it. Robbie’s sobbing voice struck us like a thousand lightning bolts. He got on the PA and announced, “Ladies and Gentleman of Ottawa, Canada. Erik Karlsson has been traded. Immediately leave the premises, we are closing. No Sally, we’re closing. I can’t take it. Everybody leave now.” Everyone shrieked in horror. I dropped to my knees as I lost all function in my legs. I lay on the ground in the fetal position beside the mop bucket repeating a thought that I never thought I’d think: How did we come to this? Remeber that beauty saucer pass up the middle to Mike Hoffman in the playoffs against the Bruins? It was like delivering the perfect pizza. Extra cheese, extra pepperoni and a few dipping sauces. My favourite is the garlic one. What about the times he won the Norris trophy? What about the times he should have won the Norris trophy? He is the best defenseman to play the game since Bobby G**d**n ORR. Sure, he didn’t win the Senators the Stanley Cup, but neither did Alexandre Daigle, so. In my opinion, he deserved better than this. He is a sure-fire Hall-of-Famer, and should have finished his career here in sunny Ottawa, Canada. Instead, snowy old San Jose will get to enjoy the excitement he brings on the ice, and off the ice. He and his wife Melinda have left a huge impression in our community and I had the privilege to join in on their recent Can’t Dim My Light campaign, a movement against bullying. I had my picture taken with him that evening. We both played ignorant and exchanged happy words but we both knew. We knew he was leaving. Yet, it still stabbed like a knife when I heard those words that day in line at the Hortons. And the thought repeats: How did we come to this? Suddenly, I am jolted from my nightmare. A few of the Horton customers began to rock the donut display back and forth chanting, “HELL NO, KARL WON’T GO”. Robbie tried to regain order by hosing the frantic customers with the ice cappuccino tank. But it was too late, Robbie had lost all control. The donut display shattered into a thousand pieces, donuts just flying every which way. I knew I had to make my break or else I was going to get in a world of hurt. You see, Erik Karlsson is more than a hockey player to Ottawa, Canada, he is a GREAT hockey player. When a GREAT hockey player leaves, something inside people’s brains SNAP, and you basically, “Go for the donuts”. I jumped through a window and tumbled into the parking lot. My vision was blurred. Upon me stood a figure with his arms reaching for me. I was like, “Erik Karlsson?” I thought he was there to save me, but as my vision rebounded, the figure came into focus to reveal....Erik Condra???? “Hello bRian5or6,” said a grinning Condra. “Then you will have to pay the ultimate price,” said Condra, pounding his fist into his hand. Suddenly, the sound of a Great Canadian Eagle reverberated though the sky. The eagle swooped down and used his massive wing to trip Erik and the Boyz onto the dirty unmopped floor. I gazed up and saw the GREAT Erik Karlsson flying the eagle. 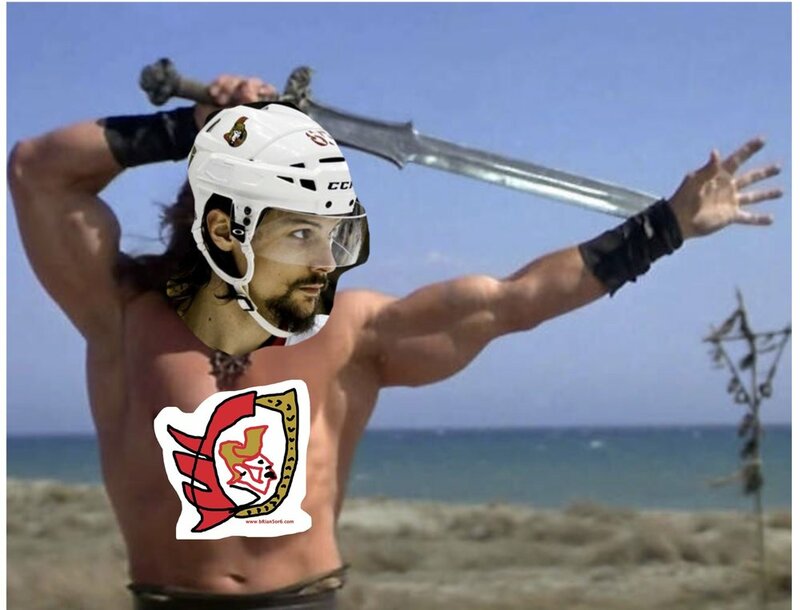 “Come with me if you want to live,” said Karlsson as he extended his arm.